Am I grateful to hear the Gospel proclaimed? Is my "Praise to You, Lord, Jesus Christ" getting routine? Or is it an act of gratitude and faith? St. Paul explained that God's word was given for "correction, rebuke, training and encouragement" (2 Tim 3:16). Do I allow Christ to use the power of the gospel to form me as His disciple? We profess the Creed using the personal "I believe". Are there areas of my life that are not consistent with what I am professing? How can I entrust more of my life to God? Am I aware of my responsibility as a Christian to offer prayers and sacrifices for others? Before each Mass, I shall spend some time reflecting on the Scripture readings and some moments in prayer asking God for a deeper hunger for his word in Scripture. 1. What is a Lectionary and how is it different from a Bible? The Church assigns specific passages from the Old and New Testament for every weekday, Sunday and holy day Mass. This ensures that we hear the Bible in its fullness, and not just a few favourite portions chosen according to the interests of the preacher. A Lectionary is composed of the readings and the responsorial psalm assigned for each Mass of the year. 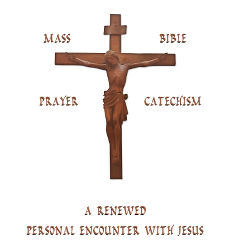 The readings are divided by the day or the theme (baptism, marriage, vocations, etc.) rather than according to the books of the Bible. Not all of the Bible is included in the Lectionary. Because the Mass readings are only portions of a book or chapter, introductory phrases, are often added to begin the reading, for example, "Jesus said to his disciples". 2. How are the scripture readings arranged in the Lectionary? The Sunday cycle is divided into three years: A, B, and C. 2014 was Year A, 2015 Year B, 2016 Year C, and then the cycle repeats. In Year A, we read mostly from the Gospel of Matthew. In Year B, we read the Gospel of Mark and chapter 6 of the Gospel of John. In Year C, we read the Gospel of Luke. The Gospel of John is also read during the Easter season in all three years. The weekday cycle is divided into two years, Year I and Year II. Year I is read in odd-numbered years (2013, 2015,) and Year II in even-numbered years (2014, 2016,) The Gospels for both years are the same. During the year, the Gospels are read semi-continuously (i.e. we pick up close to where we left off the day before, though some passages are not read), beginning with Mark, then moving on to Matthew and Luke. The Gospel of John is read during the Easter season. The year of the cycle does not change on January 1, but on the First Sunday of Advent (usually late November) which is the beginning of the liturgical year. 3. How are the Sunday Scripture readings selected? Prior to Vatican II, there was only one reading, the psalm and the Gospel. Those readings were on a one-year cycle that repeated itself each year. For example, on the Second Sunday of Ordinary Time, we hear the same readings, year after year. In order to expose the faithful to more of the Bible in the liturgy, another reading was added for each Sunday and a three-year cycle (Year A, B, C) was developed instead of just a one-year cycle. Each Sunday Mass has three readings. The first reading is usually taken from the Old Testament, During the Easter season, however, it often comes from the Acts of the Apostles. The second reading is from an Apostle (that is, either from a Letter or from the Book of Revelation), and the third from the Gospels. Between the first and second reading is the responsorial psalm which almost always comes from the Book of Psalms. Often on Sundays, the Gospel echoes themes that have been introduced in the first reading. For example, a scripture from the Old Testament that prophesies something about the Messiah is often paired with a reading from the Gospel that shows how Jesus has fulfilled that prophecy. This arrangement brings out the unity of the Old and New Testaments and of the history of salvation, in which Christ is the central figure. "All Sacred Scripture is but one book, and that one book is Christ, because all divine Scripture speaks of Christ, and all divine Scripture is fulfilled in Christ" (CCC 134). 4. Are the readings the same in all Catholic churches? One of the truly "catholic" (universal) aspects of the Church is that anywhere in the world on any given Sunday, no matter which Catholic church we walk into, we will hear the same readings proclaimed. However, the scripture texts may differ because of the different bible translations used. In Singapore, as in most English-speaking countries, we use the Jerusalem Bible. Some countries, like United States and Philippines, use the New American Bible. 5. Where can we find the scripture readings for each Mass? If a hardcopy is preferred, we can buy a missal from catholic bookstores. A missal is a prayer book that contains the readings and prayers for all the Masses throughout the liturgical year. Missals are printed in separate Sunday and Weekday versions. 6. What is the Book of the Gospels? The Book of Gospels is also known as an Evangeliary. It contains only the Gospel texts for the Mass and is used by the priest when he proclaims the Gospel. It is beautifully bound in a dignified manner and is the only other item carried in the opening procession at Mass along with the crucifix and candles and it is then placed on the altar. During the Gospel proclamation, the priest prays before the altar, picks up the Book of the Gospels from the altar and raises it up for the whole congregation to see. While we stand and sing the Alleluia, he processes to the pulpit where the Gospel will be proclaimed. After the proclamation, it is revered with the same holy kiss given to the altar. The Book of the Gospels contains the words and deeds of Jesus Christ; it is a sign of Christ's presence in the liturgy. The procession of the book is a way of reverencing the Gospel of Christ. We reverence not the physical book, but what it contains: his message of hope and salvation. We usually sit immediately after the Gospel is proclaimed by the Presider. However at a Mass presided by the Bishop, when a concelebrating Priest is assigned to proclaim the Gospel, he will request the congregation to remain standing until he has presented the Book of Gospels to the Bishop for veneration & blessing. This again underscores the dignity, sacredness and reverence that must be accorded to the Scriptures, being the Word of God. 7. Why do we sing the responsorial psalm each week? Following the first reading, there is a moment of silence to reflect on the Word of God that was just proclaimed. After reflecting on the Scripture message, we are invited to respond by singing a response taken usually from the Book of Psalms. On rare occasions, another biblical canticle may be used, for example, Mary's Magnificat (Luke 1:46 - 55) is sometimes used on feasts dedicated to her honour. The Book of Psalms is chosen because it has expressed the faith of believers for centuries and is filled with prayers of praise, thanksgiving, repentance, sorrow, trust and hope that serve as an appropriate response to the reading just proclaimed. We pray the Psalms in a call-and-response manner. A cantor sings a series of lines and we respond with an antiphon, a line repeated at intervals. This manner of singing has been part of the Mass since the very beginnings of Christianity and is probably something we learned from ancient Jerusalem. When we pray the Psalms in this way, we are praying as Jesus, Mary and the apostles did. 8. Why do we sing an acclamation before the Gospel? What does the word "Alleluia" mean? Just prior to the Gospel reading, the congregation stands as the Gospel acclamation is sung. During all of the liturgical seasons except for Lent, the Gospel acclamation is "ALLELUIA", one of the two Hebrew words (the other is AMEN) that are used un-translated in the Mass. Alleluia is an expression of joy meaning "Praise the Lord!" Praise is the purest form of prayer, because it seeks nothing for itself, but only God's glory. That is what we do when we rise to hear the proclamation of the Gospel. After the Alleluia is sung once, a Scripture verse is sung that points to, and usually summarizes, the Gospel reading about to be proclaimed. After that verse, the Alleluia is sung again. The Church omits the Alleluia during the season of Lent. It is replaced by one of several possible acclamations such as: "Praise and honour to you, Lord Jesus!" We do not use this word of solemn praise and rejoicing as there is a more sombre tone to the liturgy during Lent. We also want to cultivate a longing to celebrate the great season of Easter. At Easter Vigil, the Alleluia is restored, and the churches ring out with praise at the good news. 9. What is a homily? After hearing the Word of God in the Readings, Responsorial Psalm and the Gospel, the congregation sits for a reflection on the Word of God offered by the priest. This reflection is known as the homily which means "explanation" in Greek. It can also be referred to as 'Breaking open the Word'. As St. Augustine says "The Presider breaks open the Word of Scripture in order to nourish the souls of the faithful, just as he breaks the bread in order to feed all at the Table of the Lord." The tradition of reflecting on the Word of God is an ancient one. Jesus constantly explained the Scriptures to His disciples and they in turn continued to do to those to whom they preached after Jesus' Ascension. In the Acts of the Apostles (20:11), St. Paul preached to the Church's assembly throughout the night, "until daybreak". In the homily, the priest draws out the meaning of the passages in Scripture, which can be difficult at times to understand, and then by applies these meanings to the current situation in which the faithful find themselves. Thus, the homily relates to our experience of life in the real world. Through the Sunday homily, we learn how we might accept Sacred Scripture and Church teaching as central to our daily lives and, then, live a distinctively Christian way of life. It motivates us to lead our lives as God's leaven at work in society, whether that be in our homes, neighbourhoods or our places of work. 10. Can laypeople proclaim the Gospel or preach the homily at Mass? The proclamation of the Gospel at Mass is reserved to an ordained minister of the Church. The same is true for the preaching of the homily. As a successor of the apostles, the bishop - and the priests with whom he shares his authority - has the responsibility to proclaim the Gospel and pass on all that Christ taught the apostles (Mt 28:18-20). Since the gospels are the heart of the Bible, reserving the Gospel reading for ordained ministers reminds us how all the readings from Scripture to which the gospel point are to be read and understood under the authority of apostolic faith. The same applies to the homily which serves as a catechetical tool in order to evangelize and spread the Gospel. By reserving it to the ordained ministers of the church, it signifies that this teaching is a faithful passing on of the faith of the apostles in an authentic way as a fulfilment of Christ’s mandate to them in Matthew 28. 11. What is the difference between a homily and a sermon? 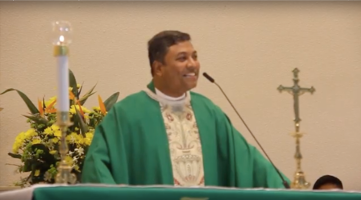 While a homily is a commentary that follows the reading of Scriptures at Mass, a sermon is a talk on any aspect of Christian doctrine and may not relate to the readings. It takes the form of a lecture or discourse to teach religious instructions - Church dogma, doctrine, history and theology - and to deal with issues of morality and ethics. When our Church celebrates a Novena in honour of St. Vincent de Paul every year, the priest preaches a sermon based on the theme of the Novena for that year and the specific topic that is assigned for each day. 12. Why do we stand and bow during the Creed? The importance of the entire Creed is indicated by our standing during its recitation, just as we stand at the proclamation of the Gospel to indicate our acknowledgment of the importance of this great liturgical action. We begin the bow at the words "by the Holy Spirit …" and rise once we have said "became man." It should be a profound bow - a bow at the waist - not a simple nod of the head. In the Mass, our gestures and postures should always reflect what we believe at each moment in the Mass. We bow at that point in the Creed to express our belief in the most central mystery of Christianity history – God becoming man - that in Jesus Christ, God actually became man by the power of the Holy Spirit. This is the Incarnation, the most sacred moment and the most important act in all of human history. On Christmas day and Solemnity of the Annunciation of the Lord, the Church asks us not just to bow at the words of the Creed, but to kneel – a sign of even deeper reverence, awe, and humility at the truth that we are celebrating. 13. Why do we have Prayer of the Faithful (General Intercessions) each week? Prayer can have one of four focuses: adoration, contrition, thanksgiving or supplication. Prayers of adoration focus on praising, venerating, worshipping or expressing our love for God. An example of this in the liturgy is the Gloria. Prayers of contrition, as in the Penitential Rite, express our sorrow for the times that we fail to follow Christ. Prayers of thanksgiving express our gratitude for everything that God has done for us. While the entire Mass is a prayer of thanksgiving, the Eucharistic prayer is a specific example of a prayer of thanksgiving. We approach the Lord confidently in faith in response to Jesus’ command, "Ask and you will receive; seek and you will find; knock and the door will be opened" (Matthew 7:7). 14. Is there a particular order to the intercessions? The intercessions move from general, universal intentions to specific, personal intentions. The petitions usually begin with a prayer for the needs of the universal church. For example, there will be a prayer for the Holy Father, priests, religious, believers or non-believers throughout the world. Next, the intercessions pray for public authorities and the salvation of the whole world. After that, the intentions focus on those oppressed by any needs, including prayers for the poor, homeless, hungry, people who struggle with addictions and social concerns such as abortion. Then the needs of local community, such as children preparing for first Holy Communion and the newly baptized. Lastly, we pray for the sick, those who have died or for the particular intention of the Mass and we also pause to silently remember our own personal intentions.